I cast my anxious eyes around. Benjamin Disraeli had to be here somewhere. We’d arrived together at the New Year’s Party jointly hosted by Sir Christopher Wren and Christopher Robin, who’d bonded over a love of minuscule birdlife and being called Christopher, and had just announced their civil partnership. The vast age difference would easily have been the elephant in the room, except that position was taken by Dumbo, who was getting giggly on his fourth sherry and claiming he could fly around the cornice. Finally my yearning eyes found a familiar face. Sir Launcelot the Brave, my manservant, had been invited as a guest, but inevitably had ended up wandering around proferring a tray of drinks. I sidled up. I followed my manservant’s gesturing eyes. Of course. The kitchen. I slipped through to find my erstwhile friend by himself, eagerly scooping party snacks out of their serving dishes with his index finger. Hoummos or tiramisu, it didn’t seem to make a difference. “What indeed,” I offered feebly, sinking into an antique pouffe, much as Christopher Robin planned to later on. Finding my friend amid the anachronistic collective had dispelled my rising social panic, and I felt content to sit in silence. Benjamin, however, never was one to let silence stifle repartee. Benjamin’s smile was a triumphant argent shard. I sucked air through my teeth. The question was a good one. I thought whilst maidservants bustled through the kitchen to collect novelty ice cubes. And after a while, I raised my head. “You know, for the most part…yes. I spoke to you* a year ago of a year of recollecting, gathering, of pulling together a self split asunder by more travel, novelty, black times and high times than I was equipped to take. I was exhilarated and tired, doing my best to process a self-inflicted tumult which I never had long enough moments to come to terms with. Benjamin, I was bleeding out and grinning like a demon. “And so I spoke to you of coming back, of a year spinning on a mid-summer hub of a pre-booked return ticket. And no, I didn’t know it all. I didn’t know the shade of heartbreak that airport would assume. I didn’t know that I would breathe the eucalypt mist of the Blue Mountains, that I would miss the end of my own leaving party after a literal volcano of sangria, or spend my coming-of-age by a bonfire of palm-fronds on the Pacific shore. “…but Benji, all of these are matters of degree. I did know that I would squeeze Australia for every experience my every last dollar could get me. I did know that I would leave already missing friendships forged from humid, dehydrated, adamant steel. I did know that I would touch my soles to Edinburgh streets with a scintillation of glee. I knew that the tension would be lower once I was back—excitement maybe curbed, security increased a thousandfold, the study of literature again undertaken as a joy and not a chore. That old friends would still be there, that steel untarnished. The ibises replaced by squirrels, boardshorts with knee-length coats. Benjamin raised his eyebrows, and raised a finger as though to object. And then, to my surprise, he lowered it, and nodded thoughtfully. I spread my arms wide and shrugged, a bizarre gesture which made it look like I was lifting a small elephant. What to say? That I would graduate—hopefully? Get a job—if there was one? Try to do more exercise? Write, think, walk wheresoever the wherewithal to wander was mine to command? Try not to get things wrong? And with that, Benjamin Disraeli walked through the door to rejoin the New Year’s party, and I was left in the kitchen, to reflect, by myself. "Grief is the agony of an instant, the indulgence of mixed party dips the blunder of a life....what!?" 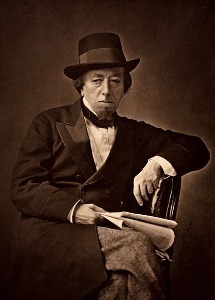 *And dearest of readers, not to labour the device, but remember always that Disraeli is yourselves, and your very self Disraeli. Well I be done seen bout ev’rything / when I see an elephant lie.